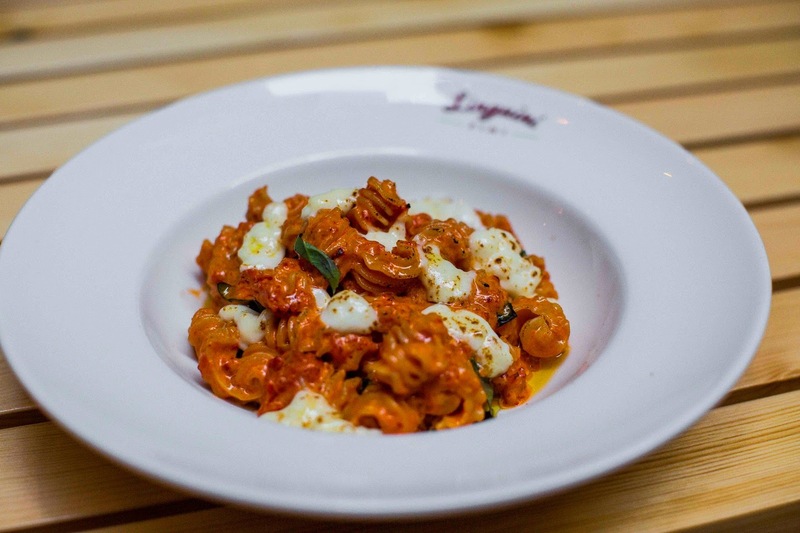 Linguini Fini quietly closed shop at L Place late last year, apparently because of rising rents, but then moved to Elgin Street by the escalator to even higher rents. 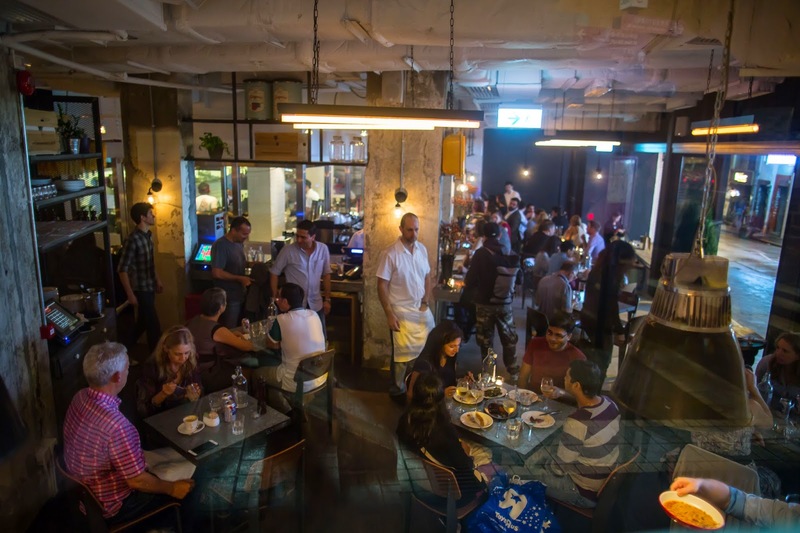 But perhaps the Mid-Levels neighbourhood suits the casual New York Italian eatery more than Queens Road Central where diners had to take an elevator to the restaurant. The space at the new Linguini Fini opens up to the street, tempting many people to walk in for a table, but it's best to reserve one to avoid disappointment. Come here for a relatively healthy meal -- all the vegetables come from local organic farms, while the water -- still or carbonated -- is made in house. There's a food compost at the back, and to counteract the smells, a herb garden will be planted there too. Fans of the restaurant will be happy to know most of the favourite items are still there with some new additions. The homemade spicy pork sausage (HK$108) is a hearty one made with lean meat, but perhaps that's why it doesn't hold together once you cut into it. Nevertheless it has a mild spicy kick to it, and is accompanied with chili and oregano mustard, as well as stir-fried peppers and onions. Chef Vinny Lauria has come up with the Italian version of xiao long bao (HK$168), but sadly it misses the mark. For starters it's a rectangle and too big to fit in the mouth in one bite, so when half of the pork dumpling is eaten, the juices inside dribble out and loses flavour. 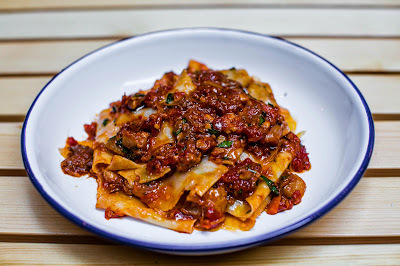 However the homemade pastas were fantastic, the very thin pappardelle (HK$178) soaked up the sauce of the nose to tail bolognese that includes pork, veal and oxtail. We also enjoyed the radiatore alla vodka (HK$148), squiggly pasta that also had more surface area to pick up the slow burning spicy sauce of 'nduja pork sausage, with a touch of cream sauce, topped with mozzarella and basil. And for those wanting a seafood item, the garlic butter black cod (HK$188) is a delicious dish, cooked perfectly -- but then again with cod it's hard to overcook -- and came with lemon, capers and anchovies. Our only complaint was that it was on a bed of crispy kale that was doused in oil that tempered our appetite for that dish. 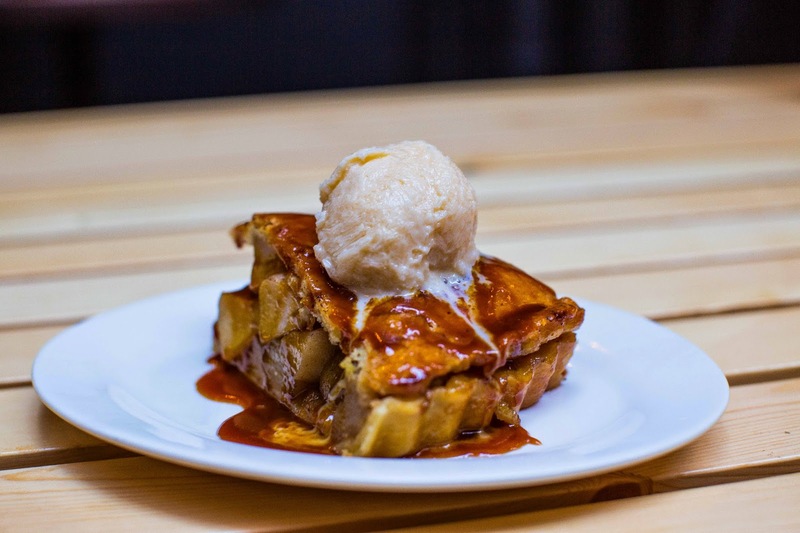 Nevertheless, for desserts, the caramel apple pie (HK$78) comes in a hearty slice with large slices of apple underneath and a scoop of vanilla ice cream, while the chocolate banana cake (HK$78) is a sinful treat that looks sweet, but isn't going to spike your sugar levels... too much.